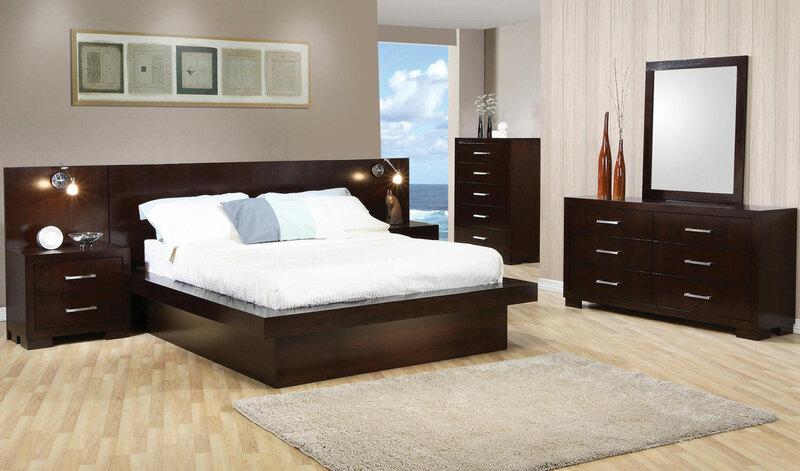 Jesmond Flotation Pier Panel Bed Group with Fast Free Shipping! The Jesmond Pier Panel Bed features a sleek contemporay style design featuring a headboard panel and two side panels with two nightstands. The platform extends to form a 6" seating rail with three romantic undermount lights. Features solid wood and ash veneer in capppuccino finish. 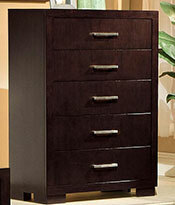 Includes: panel, platform, 2 nightstands and back panels without lights. (Does not include mattress). Mattress sold separately. Panel Bed in solid wood and ash veneer in cappuccino finish. This design features 3 romantic lights under the 6" seating platform rail with an on/off switch close at hand. 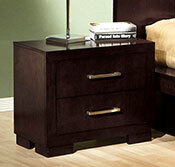 Includes: panel, platform with under lighting, 2 nightstands and back panels without lights. (Does not include mattress). Mattress sold separately. The Jesmond Flotation System includes: Panel, platform with under lighting, 2 nightstands and back panels without lights, and 8" deep plush-top soft side mattress for a complete modern flotation system. Available in Queen, King and Cal. King sizes. The Jesmond Bed Includes: panel, platform, 2 nightstands and back panels without lights. Premium full depth 8" water mattress for a complete flotation system. The Jesmond Bed Includes: panel, platform, 2 nightstands and back panels without lights. (Does not include mattress). Mattress sold separately.